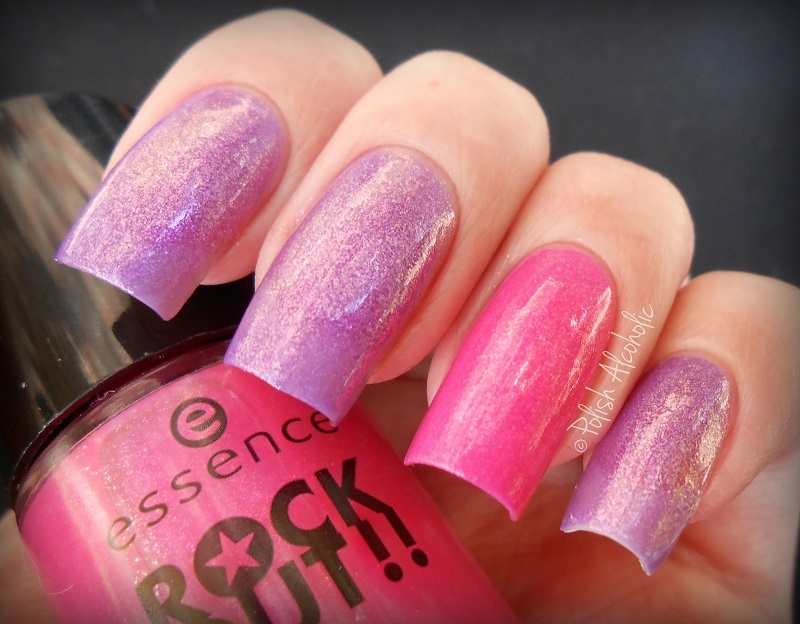 Today I have a recently released collection by Essence to show you, Rock Out!! “essence loves music! 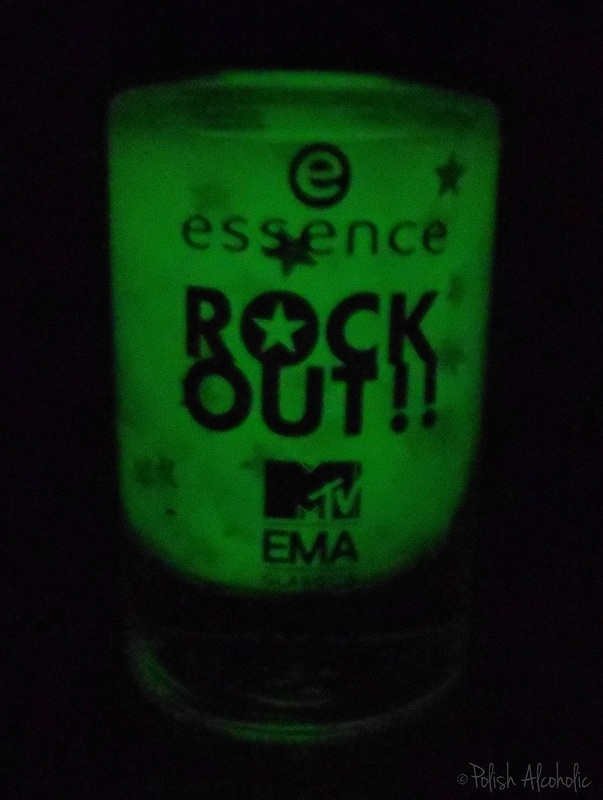 things are going to get musical in october and november 2014 with new trend edition “rock out!” – essence is once again an official sponsor of the MTV European Music Awards. glasgow is ready to welcome the who’s who of the international music scene on the 9th of november 2014 and fans can look forward to a breathtaking show. First up, two favorite colors of mine… pink and purple! The pink one is called Best Pop and contains lots of pink and gold shimmer, fleck like. Yummie! The formula is nice and the pigmentation of this one is good. I used two coats plus top coat here. The lilac one, Best Female, one the other hand is extremely sheer. It also has lots of gorgeous shimmer but I did needed three and a half generous coats for full opacity. And still I have some visible nail line. And here we have Best Hip-Hop, a very sheer gunmetal base packed with fine multi colored glitter. I’m doubting if this is buildable to an opaque finish on it’s own so I layered it over a grey base color. On my accent nail I’m wearing two coats of Best Rock, a metallic silver base with a hint of fine multi colored shimmer. 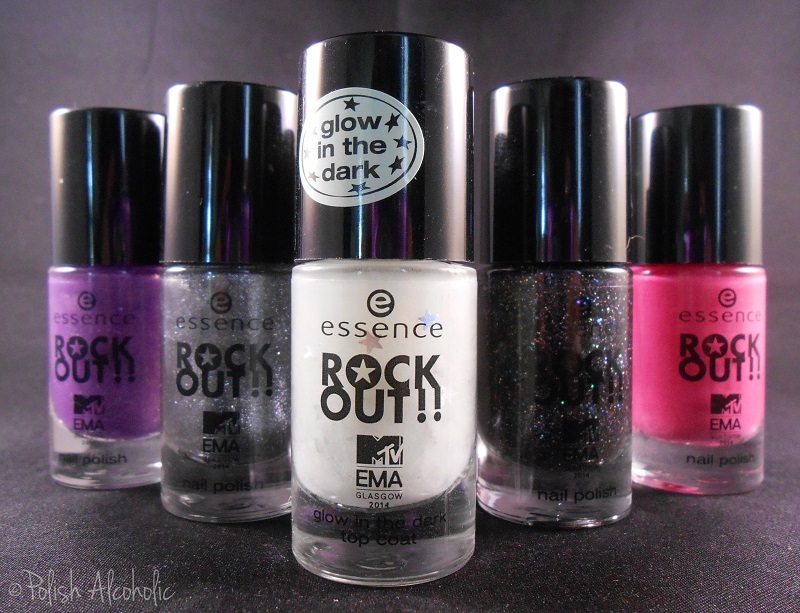 This entry was posted in Essence and tagged best female, best hip hop, best pop, best rock, biggest fan, essence, essence rock out, glow in the dark, review, rock out, swatches, top coat by Polish Alcoholic. Bookmark the permalink. I saw the LE in stores today and I am happy I didn’t spend any money on it.. Doesn’t sound/look really worth it to me. Thanks for the review!